Please refer to our stock # 10651 when inquiring. 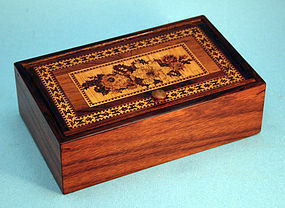 Antique Tunbridge Ware Trinket Box in Rosewood having a hinged lid inlaid with a floral spray taken from Berlin woolwork patterns, framed by bandings of tessellated mosaic marquetry. Circa 1840.